Let’s take our democracy back from Wall Street. We need a new politics for the other 99% of America that doesn’t collect a CEO’s salary or write big checks for politicians. “The Candidate of the 99%” to cheer on Occupy Wall Street protests in 5+ California cities. Green Party events, campaign events, and media interviews also a part of Jill Stein’s first California tour. Green Party presidential candidate Dr. Jill Stein tours the Golden State this week, with visits planned to Occupy Wall Street protests across northern and southern California, as well as a presidential primary debate before the Green Party of California state convention in Los Angeles. The tour begins Monday, November 28th, and runs through Monday, December 5th (full schedule below). 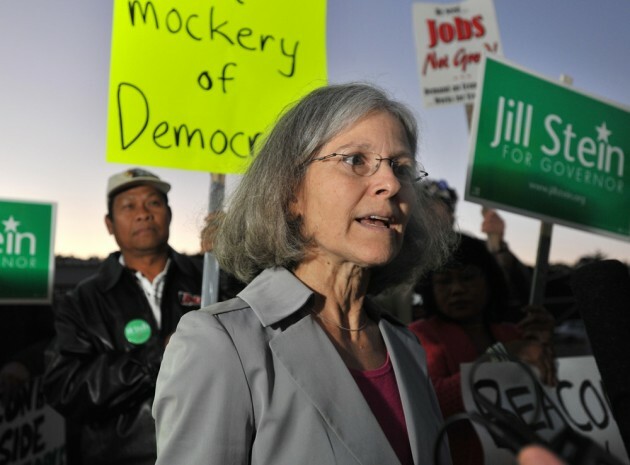 Jill Stein announced her presidential campaign on Monday, October 24th, before a crowd of supporters at the Massachusetts Statehouse in Boston. Stein is a medical doctor and prominent health care advocate. Her California tour follows on a statewide tour of her childhood home of Illinois earlier this month. Please see http://www.jillstein.org for any last-minute changes or updates.